Justicia carnea is a brilliant flowering shrub originally from Brazil. They have been in Australia for a long time in sub tropical gardens and are only now making a comeback. Thriving in warmer climates, in cooler areas they are treated as tender perennials. With flowers held above nice green foliage in summer. Justicia carnea will reach around 2m and from the names ‘Flamingo Plant’ and Justicia carnea ‘alba’ we can quickly guess that cultivars exist with pink, red or white flowers. 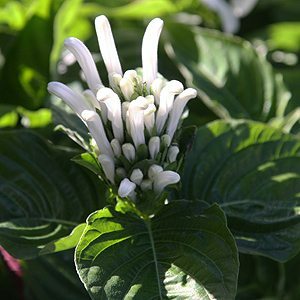 Pictured right is Justicia carnea ‘alba’ wonderful flowers and a highlight in a shaded position in a tropical or sub tropical garden. And yes they will grow as far south as Melbourne given a warm position. Best suited to warmer climates, justice carnea is fost tender and is often grown as an indoor plant in the cooler areas of Australia. A position on a patio with plenty of filtered light and some warmth will do nicely. In the warmer climates these wonderful flowering plants can be grown outdoors. Justica aura is a yellow flowering species that will reach around 2m, summer flowering best in full sun to part shade in warmer conditions.